As the end of August was dawning and families with children began to turn their attention to school preparation, probably agonizing over the costs of the expected new outfits, supplies and the latest trend in back packs, an unexpected and harsh blow was dealt to some of these families in Toronto. Housed in retrofitted shipping containers, Market 707 is Toronto's most unique street food and retail market. This space brings together local entrepreneurs serving up more than 10 types of delicious international street food, along with unique goods and services to create an urban food and shopping environment unlike any other. Stop by for an event or take a lunch break on the sidewalk patio. Emerging out of our experience with Market 707, Scadding Court has developed “Business out of the Box” model – a social franchise model that creates affordable retail space in the form of shipping container markets. Need to Study for the Citizenship Test? CitizenshipCounts.ca and DeviensCitoyen.ca are OCASI's national websites and Android | iPhone apps that help newcomers study for the citizenship test. They feature an online quiz that has province-specific questions, and over 500 flashcards on all topics ranging from Aboriginal Peoples to Elections in Canada. "I aced the test. 20 out of 20. Your website and mobile app helped a lot. All the material I read about Canada made me appreciate this country that I am about to call my permanent home and the reason why I choose to become a citizen. Thank you so much for all your hard work putting this together!" Since launching last October, the extremely popular websites have had over 1 million visits and over 20,000 users have downloaded the apps. This project is funded by Citizenship and Immigration Canada. NewYouth.ca is OCASI's Online Community for Newcomer Youth in Ontario. The aim of the site is to bring settlement information directly to young newcomers using a variety of channels. NewYouth.ca enhances the accessibility of settlement services for newcomer youth by utilizing content that is written in clear and appropriate language, multimedia technology and online social media tools. It also provides youth with a venue to ask questions and receive accurate information and referral online from qualified peers and professionals. The site averages 500 users per day and provides students with resources to post-secondary education, including a comprehensive list for scholarships, grants and bursaries. (www.newyouth.ca/scholar) It provides young newcomers with the tools to find work in the province. Moving to a new country or city can be a challenging experience for youth. NewYouth.ca provides a number of resources to deal with the stress, anxiety and barriers facing newcomer youth in Ontario. Information and Action Kit on Bill C-585 is a public education tool to raise awareness about the Bill, understand its' potential impact on vulnerable populations such as refugee claimants, and help organizations across Canada take action against this Private Member's Bill. Bill C-585 could have serious implications for the income security of refugee claimants and other people without permanent status in Canada, as it would allow the provinces to restrict their access to social assistance benefits. Introduced by a Conservative backbencher in April 2014, the Bill is scheduled to be debated at Second Reading on September 16, 2014. Taking action right now is therefore critical, as expressing opposition before Second Reading could lead to the Bill being defeated or withdrawn. The deadline is September 25th, 2014 and, if approved, funding will be available for two years starting on April 1, 2015. Preference is to be given to organizations that have been in existence for at least five years at the time of submitting their application. For questions or clarifications contact CIC at [email protected]. 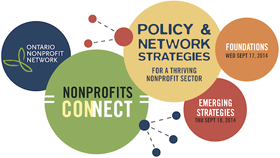 Join nonprofit leaders and thinkers from across Ontario to connect the provincial policies and systems that impact the nonprofit sector. Make connections, catch the latest trends, and contribute your knowledge and ideas to emerging strategies. The Ontario Ministry of Children and Youth Services (MCYS) has announced the names of 14 Lead Agencies, as part of the process to transform the way community based mental health supports are delivered to children, youth and their families in Ontario. These Lead Agencies are the first wave and will be responsible for working with local child and youth mental health providers and other community partners to determine how best to meet the needs in their communities. Ontario is to move toward the implementation of Lead Agencies in 34 Service Delivery Areas across the province. The initiative comes out of ‘Moving on Mental Health' released in November 2012, a part of Ontario's Comprehensive Mental Health and Addictions Strategy. Children's Mental Health Ontario (CMHO) has been working closely with the Ministry of Children and Youth Services (MCYS) in the transformation process. The list of Lead Agencies announced by the MCYS, as well as further information on the System Transformation initiative, can be found at: www.ontario.ca/movingonmentalhealth. All information is also posted here on CMHO's website. The Opening Doors Project is a free day-long participatory session delivered in Toronto that aims to raise awareness around the impacts of migration, racism and other forms of discrimination on the mental health of newcomers, refugees, immigrants and people dealing with mental health issues. It is a joint initiative between The Canadian Mental Health Association – Toronto Branch, Access Alliance Multicultural Health and Community Services and Across Boundaries, and is funded by Citizenship and Immigration Canada. Through popular theatre activities and interactive discussion, the workshop will develop professional skills in order to foster welcoming communities for newcomers, refugees, immigrants and people dealing with mental health issues. Upon completion, participants will be awarded The Opening Doors Project Critical Development Certificate. Sign up as soon as you can as we tend to fill up quickly. If registration is full, please email us at [email protected] to be added to our waitlist. Please register at the following click here. The workshop is at no cost to participants. Spaces are limited and will be filled on a first come, first served basis. Did you know the Ontario nonprofit sector generates $50 billion in economic impact to the province? This translates to 2.6% to the GDP, more than auto manufacturing and retail industries, with a labour force of 600,000. 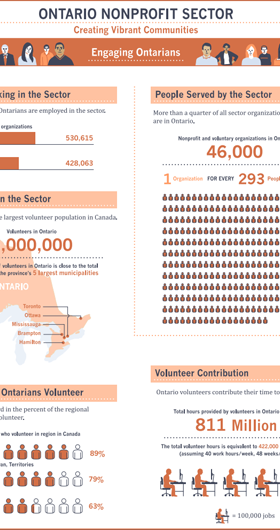 Learn more about the blended value the sector provides in this Infographic of the Ontario Nonprofit Sector.